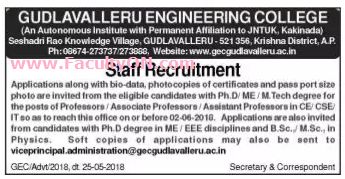 Gudlavalleru Engineering College, Krishna has advertised in the SAKSHI newspaper for recruitment of Teaching Faculty- Professor / Associate Professor / Assistant Professor jobs vacancies. Interested and eligible job aspirants are requested to apply on or before 02nd June 2018. Check out further more details below. About College: Gudlavalleru Engineering College is the vision of Late Sri Vallurupalli Venkata Rama Seshadri Rao, the man behind the college. It was started in the year 1998 by the AANM & VVRSR Educational Society with an intake of 180 students, and the current intake is 1140 in UG B.Tech and 336 in PG M.Tech and MBA.